The Nursery Has Been Painted and I love the Uppababy Vista! The color is Benjamin Moore “Crystal Blue” which is a like a pale robin’s egg blue. We chose to use the low VOC aura paint which is like $50 a gallon. Then, because it would negate the whole purpose of using the aura paint if we didn’t, we had to also buy the aura white paint for the ceiling. We also got the 8-drawer hemnes dresser at Ikea, I hope it doesn’t make the room feel too small once we get the crib in there! Its big enough that it should hold all of Jasper’s clothes and we can use the smaller top drawers for diaper changing stuff.. or we may put in some shelves above it for the diaper stuff. We’ll see. I’m also going to go ahead and order the crib. It’s on my registry, but I’m afraid that by the time my shower comes around it may be out of stock and then we’ll be screwed. On the way back from Ikea we had JUST enough time before they closed to stop at Buy Buy Baby and check out the Uppababy Vista Stroller. I had read alot of good things about this stroller but wasn’t convinced I’d like it more than the bugaboo. It weighs about 5 lbs more than the frog and so I was skeptical. 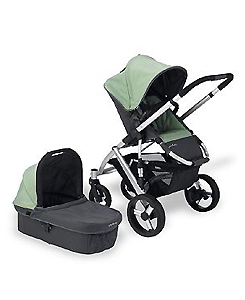 But, it was love at first sight and I was easily able to pick up the stroller even with one hand, so the weight (25 lbs including frame and seat or bassinet) is not an issue. 1) The undercarriage basket is HUGE. Much better than the bug. 2) The bassinet is really cushy and the matress in it has all sorts of nift features like the shell can be zipped out to wash and it’s reversable so that it’s mesh for hot weather and foam for cold. 3) It folds with the seat on. This is a big one for me.. once Jasper has outgrown the basinett, no need to take off the seat ever again. 4) It comes iwth more accessories like a mosquito/Sun mesh sheild thing and a rain cover. 5) It has all wheel suspension which the Chameleon does, but the Frog does not. 6) It has rubber tires that can’t get flats. 7) It has no axis bar to kick accidentally between the two back wheels. 8) The handle telescopes up which the Chameleon does but the Frog does not. 9) It is useable up to 40lbs so should last a bit longer. The only feature it doesn’t have that the bugs do is that the handle position is not reversable. The seat is, but you don’t have the choice of having either the smaller or larger wheels facing out. Not sure how much of a downside this is given that MOST other strollers don’t do this. New for the Vista in 2008 are a cup holder attachment and slimmer wheel base (24 instead of a really wide 26.5) so even though you can find some deals on the 2007 model online, I think it’s worth it to get the ’08 version. Father-to-be Eric Discher wrote a really thorough review of the Uppababy Vista on his blog. It’s a little hard to read because he’s having problems with the paragraphs working on his blog, but there’s lots of good info there. Uh oh Chantal (I love that name :) if it’s too big for your room it’s probably too big for mine. I don’t think they make rooms much smaller than ours! P, that’s so great they had everything! I can’t wait to see it all set up. We’re getting the Baby mod park lane dresser.. Thanks Katherine, I’m finally feeling a bit better! Nursery looks great! I, too, already bought a crib set that was very reasonably priced and I just had to have it — it’s the Baby Sesame Street set from Target.com. I just love it, and hubby approved because Oscar the Grouch is represented on the bumper and quilt. I’m sending you good vibes on your health!! I love the name!! I have a good friend with a jasper — too cute. we spent yesterday at ikea and left with the hemnes cabinet (with removable changing table top) and wardrobe. we struck gold because all 3 items were listed online as being out of stock. the crib comes tomorrow! so exciting! your nursery will look great! what crib are you registered for? Love the nursery, and the name! We also bought the HEMNES dresser for our nursery but opted for the smaller version, since we’re putting in a bookcase and a closet organizer. I really wanted the larger one (that you have) but our room is too small. Oh, you and I are having (or maybe had in your case if you’ve decided) the same stroller dilemma. I was sold on the Frog until I started looking at the Vista. The only negative I’ve heard about the Vista is that without that straight axis bar between the back wheels, if the stroller is loaded with a) an older kid at or near the weight limit or b) the baby/toddler AND lots of bags the wheels tend to turn in under the weight. I suppose this could cause uneven wear on the tires and weak spots in the frame. Love the name! Love the beginnings of the nursery! Your Jasper is a lucky little guy. Lou, yeah, I don’t get it – I thought the orange was a clear appeal to the dad types, but its totally lost on my husband too! Farah, I know I never made an official “we picked the name post” but it happened on our anniversary. We just decided and the fact that it was our anniversary dinner seemed like a good omen. I’ve been calling him Jasper in my head and to everyone else since so it just kind of slips out here too. Nursey looks GREAT. I think you spilled the baby’s name -if so i LOVE IT!! I like green — but that is because i picked a green peg perago one. I’m all about orange, but it’s my husband’s least favorite color. Bah!